Figure 1. The solid line is Skelmorlie at 40 fathoms, the long dash line is Chesil Beach at 16 fathoms and the short dash line is Maplin at 7 fathoms. 1 fathom = 6 feet = 1.8288 meters. 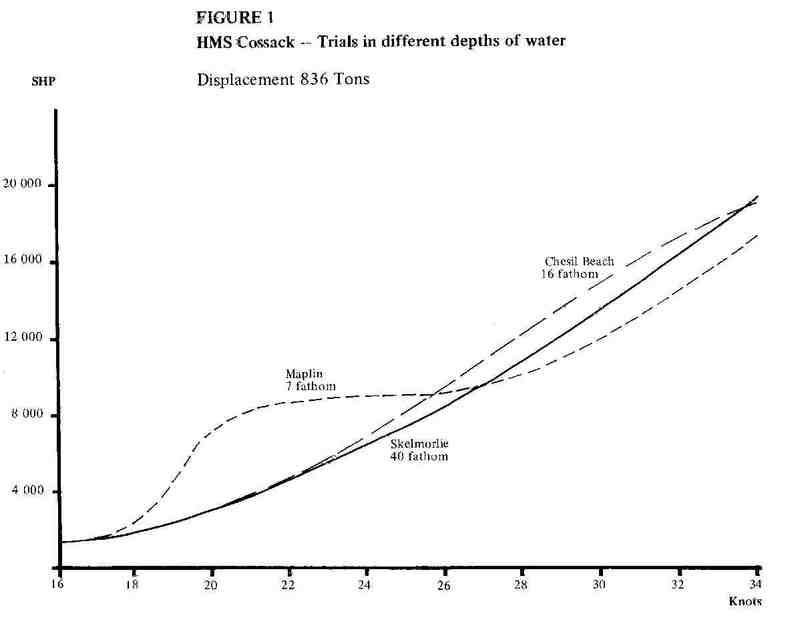 Figure 1 shows speed/power curves for HMS Cossack for speed trials performed at the Maplin (shallow), Chesil Beach (intermediate) and Skelmorlie (deep) measured miles that clearly show the shallow water effect. In brief, a ship recording 30 knots at Maplin will only manage 28.0 at Chesil Beach and 28.5 at Skelmorlie. From this figure, you can see that the same SHP produces different results depending upon the depth of the water. The interesting point for the Maplin measured mile is at 18 knots where there is a very sharp increase in the amount of power needed for a speed increment. This is the pad of water building up under the hull. As soon as the pad is complete, there is a long period (up to around 28 knots) where the ship is riding the hump and there are great gains in speed for very little power addition. Finally, above about 32 knots the advantage becomes less obvious and the speed increases are similar to those in deeper water though still with a discernible benefit. The hump is caused by the positive pressure wave generated by the ship's entry to water and its density (supporting capability) is proportional to the weight of the ship. It is inversely proportional to the square of the ship's relative length. Thus comparing a 200 foot destroyer weighing 1,000 tons compared to a 20,000 ton battleship 600 feet long will show hump effects proportional to 20 times greater on weight grounds but 9 times less on length grounds or a hump 2.2 times more effective for the battleship. This will push the hump itself down to lower speeds and prolong the "cruise control" portion where the ship is riding the hump. For other reasons, it won't effect the speed after the hump effect much. Back in the early 1900s, the British Admiralty paid bonuses or extracted penalties based upon the speeds achieved on builder's trials. For the Tribal class, of which HMS Cossack was a member, the penalty was £1,200 per 0.1 knots under the contract speed of 33 knots, rejection if it was 2 knots under, and a bonus of the same amount if the ship achieved 34 knots. At the time, £1,200 was roughly 1% of the cost of the ship, so it can be seen that this was a significant sum. In the case of Cossack, the builder's trials at Skelmorlie (deep water) achieved only 33 knots but at Maplin she made 34.3 knots. There were multiple claims and counter claims based upon these speeds, complicated by some additional penalties imposed by the Admiralty for late deliveries. The Admiralty tried to establish the facts of the matter by running Cossack over three measured miles of differing depths, the results of which were used to produce the graph above. As can be seen, the ship's speed for a given amount of SHP was drastically affected by the depth of the water at the time of the trial. The builders sued for the bonus and the case made it's way to the House of Lords. Unfortunately for the Admiralty, the builder's contract they had issued did not specify any particular measured mile to be used for the speed trials and the builders even had a letter from the Admiralty stating that there was "no objection" to the Maplin mile being used. Ever since that time, all Admiralty contracts have specified which measured mile is to be used for propulsion trials. This is something I found lurking on my hard drive. The essay below was part of a discussion Stuart and I were having back in 1998 about speed trials. This particular essay presents an interesting illustration of how the depth of the water impacts the amount of shaft horsepower (SHP) it takes for a ship to attain a certain speed.